Jayashree is insane. At least that’s what the staff at the psychiatric hospital have been telling her for the past five years. 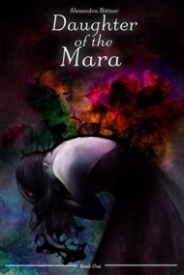 But when a stranger with peculiar gifts arrives at the hospital and helps her escape she quickly learns her ability to dream while awake doesn’t make her crazy, it makes her a Mara. As she learns to control her gifts with the help of her rescuer Harvey, Jay soon discovers there is more to being a Mara than creating nightmares. Does she have what it takes to fulfil her destiny? The first chapter was full of intrigue and interesting characters drawing me in straight away. It was an original story and I enjoyed learning about the world of the Mara. The first few chapters may have drawn me in but at times I did feel the story was quite slow. It took a while for anything exciting to happen and Jay could be quite annoying, especially when she developed feelings for Harvey’s brother when they’d only met a couple of times. But, her school girl behaviour only made me care and root for Harvey. This was a great kick off to a very interesting and original series. Now that the story has been built and set, I expect the next book will be much faster paced and I look forward to watching Jayashree grow as a Mara.